Anti Slip Stair Nosing inquiry has increased dramatically in the last few years. A significant percentage of inquiry is based around the types of nosing and how we install it. 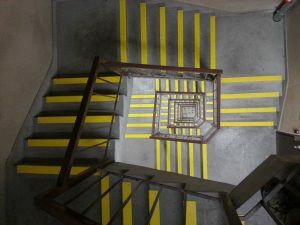 It is important to understand some of the terms when researching so here are some stair basics. A "flight" of stairs is defined as a constant series of risers including winders that is not interrupted by a landing. 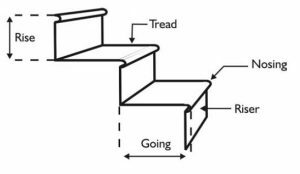 The stair "tread" is the horizontal portion of a set of stairs on which a person walks. The tread can be composed of wood, metal, plastic, or other materials. In residential settings, treads can be covered in carpeting. Stair treads can also come in non-slip varieties, particularly in commercial or industrial locations however most Anti Slip Stair Nosing we do in commercial or industrial is bringing the existing stairs up to current Australian standard AS1428.1. A stair "riser" is the near-vertical element in a set of stairs, forming the space between one step and the next. It is sometimes slightly inclined from the vertical so that its top is closer than its base to the person climbing the stairs. The number of stairs in a flight can vary widely. It depends upon the building they're located in and how much space there is between floors in the building. Australian regulations require each flight must have no more than 18 risers. There are many types of retrofit Anti Slip Stair Nosing including Aluminum, Steel, Fiberglass and Stainless and each type will have a different installation fixing dependent on the stair surface. For concrete stairs we generally drill, apply adhesive the anchor with expanding fixings. For timber we generally drill apply the adhesive the anchor with exposed or hidden screws. For steel stars often checker plate we drill apply adhesive and rivet. Although we have completed many hundreds of installations over the years each one is different, so it is very important to get it right the first time. As stairs vary significantly most of our nosing is custom cut to fit the stair and particularly on larger jobs with custom lengths and finishes we will general require a deposit. 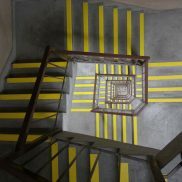 Choosing the correct Stair Nosing is critical and you should always speak to a professional before selecting or installing stair nosing to ensure you meet Australian Standards and make your environment safe. If you would like further information on stair safety or compliance requirements check out some of our other articles here or contact us at Friction Systems Australia.